Germany goes to the polls in three weeks from now in its richest region, Bavaria. Whereas the governing parties CDU/CSU and SPD would like nothing more than to discuss the thriving economy or even their relations with Russia or the US, the focus remains squarely on immigration and the right-wing protest marches. A further worrying sign for Ms Merkel’s coalition government of her CDU/CSU conservatives with the SPD socialists is that some of their government’s forces (police, intelligence agencies) seem to choose the side of the up-and-coming right-wing anti-immigrant AfD (Alternative fur Deutschland) in recent weeks. 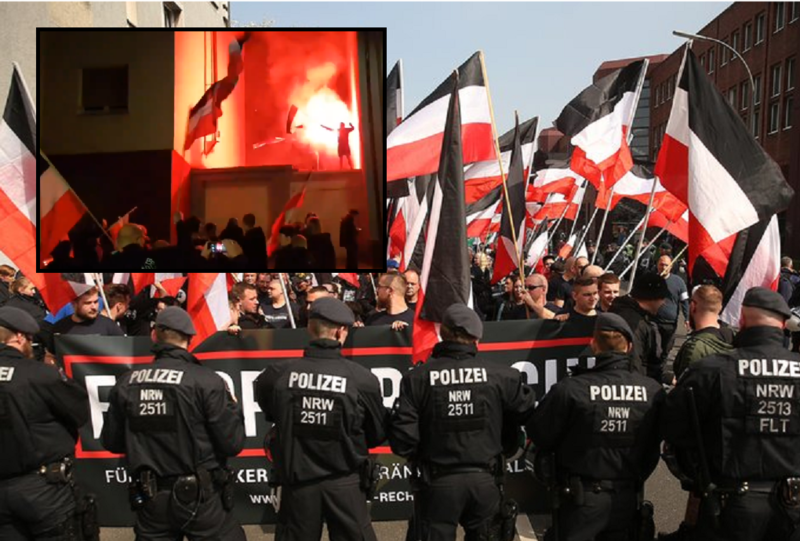 On Friday night, some 200 neo-nazis marched through the city centre of Dortmund, one of the biggest cities in Germany, while police let them carry on shouting slogans like "Whoever loves Germany is an anti-Semite," and "National Socialism now!" (referring to the political party of Adolf Hitler). Footage widely available on social media shows how they were parading through the streets of the city centre holding flags of the pre-World War I German empire. Some Dortmund residents are said to be deeply shocked that this display was allowed. They were also astounded that the police let it go on for hours on end without breaking up the rally. Related coverage: <a href="http://thegoldwater.com/news/37607-Germany-Elections-Shock-As-AfD-Now-Second-Biggest-Party-In-DeutschlandTrend-Poll"> Germany Elections - Shock As AfD Now Second Biggest Party In ‘DeutschlandTrend’ Poll</a>. Dortmund city police released a statement in response to the allegations, saying: "We have documented the behaviour of the right-wing extremists. The criminal relevance of this is being reviewed." The Social Democrats (SPD), who have recently seen the AfD pass them in national polls and are losing popular support, slammed both the Dortmund police and the state government of North Rhine-Westphalia, a province controlled by Chancellor Angela Merkel's Christian Democrats (CDU). In an open letter published amongst others in the Westdeutsche Allegemeine Zeitung, they said: "What has the state government done to distance itself from the ugly scenes of that evening, to stop them, and to protect our constitution?" State Interior Minister Herbert Reul has not responded to the neo-nazi marches yet.